Sharks have unlimited sets of teeth. Fangs are not found in all snakes, but all snakes do have teeth, usually in six rows. Their teeth are curved backwards like the barbs on a fishing hook, which keeps their prey from escaping. "Long in the tooth," is a phrase meaning old. It was originally used to describe horses. As horses age, their gums recede, giving the impression that their teeth are growing. The longer the teeth look, the older the horse. It is an aggravated assault In Louisiana to bite someone with your false teeth but simple assault if you bite someone with your natural teeth. It takes 17 muscles to smile --- 43 to frown. Jaw muscles can provide about 200 pounds of force to bring the back teeth together for chewing. The average human produces 25,000 quarts of spit in a lifetime, enough to fill two swimming pools. The only bone in the human body not connected to another is the hyoid, a V-shaped bone located at the base of the tongue between the mandible and the voice box. Its function is to support the tongue and its muscles. The sound of a snore (up to 69 decibels) can be almost as loud as the noise of a pneumatic drill. 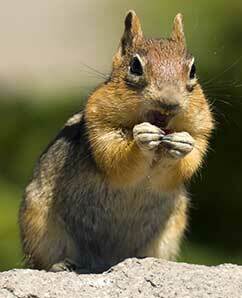 A squirrel's teeth grow continuously. 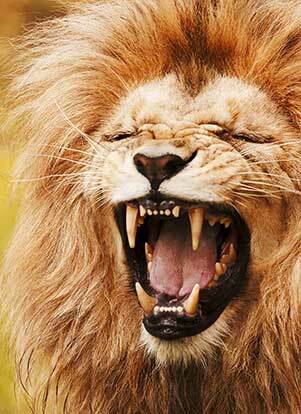 Their incisors can grow up to six inches per year, but stay short due to the constant wear they receive. Cats have 30 teeth and dogs have 42. In the United States, close to 3 million miles of dental floss was purchased in 1996 by dental consumers. Paul Revere was a practicing dentist. Rodents' teeth grow all their lives. Reptiles' and sharks' teeth are replaced constantly, before they wear out. A crocodile replaces its teeth over forty times in a lifetime. Elephants' tusks are specialized incisors for digging food up, fighting and lifting. Aardvark teeth have no enamel coating and are worn away and regrow continuously. Aardvarks are born with conventional incisors and canines at the front of the jaw, but these fall out and are not replaced. In adult Aardvarks, the only teeth are the molars at the back of the jaw. Opossums may have other predators to worry about, but they should feel pretty safe around snakes. They are one of a only a few animals (others include woodchucks and raccoons) that produce chemicals that render snake venom harmless. Scientists have tried to discover just how this chemical defense works in hopes of creating a vaccine to protect humans from snake bites, but so far have not been successful. The Statue of Liberty's mouth is three feet wide. How can you tell when a gorilla is angry? It sticks its tongue out. An average person laughs about 15 times a day. A sneeze zooms out of your mouth at over 600 m.p.h. An elephant's tooth can weigh over six pounds! That's heavier than a big jug of milk! Even though whales are very big, some of them don't have any teeth. Instead, they have rows of stiff hair like combs that take food out of the ocean. Snails are very small but they can have thousands of tiny teeth all lined up in rows. Rabbit's teeth never stop growing. They keep them worn down by gnawing on bark and other hard foods. 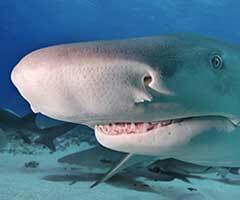 Lemon sharks grow a new set of teeth every two weeks. They grow more than 24,000 new teeth every year! Teeth are heavy and require considerable muscle to operate efficiently; this has made an important contribution to the evolution of the mammal skull. Mammals are heterodonts; this means some of our teeth are different. In fishes and reptiles the teeth are all basically the same, some bigger than others but the same basic shape. Mammals needed their teeth to do several different jobs and so mammal teeth evolved into different forms. Mammal teeth can grind, stab, scissor, dig, chisel, sieve, and in the case of elephant tusks - lift. Teeth are the hardest part of any mammal and therefore they are the part most often fossilized. The number, size, organization, and shape of the teeth are different in every species of mammal and can be used in taxonomy, especially of fossils. In fact without teeth the fossil record would be much harder to understand. Mammals have only two sets of teeth, the first set they get soon after birth, often called the 'milk teeth' and a larger set they acquire as an adult. The larger set has both more and larger teeth to fill the larger jawbones. In all other toothed vertebrates teeth just keep coming, no matter how many you lose there is always another one ready to take its place. In other words fish amphibians, reptiles, and birds either have no teeth or numerous sets. Teeth do not last forever, like everything they wear out. How fast they wear out depends on what the animal eats. Herbivore teeth in particular tend to wear out at a specific rate. This is very useful for biologists as it allows them to age an animal by looking at its teeth. Therefore, the skull of a long-dead animal can supply useful information by faithfully retaining the information of how old the animal was when it died. Elephants have the largest teeth in the world. An Elephants tusks are actually modified incisors. They arise from the upper jaw and only 2/3s of them are visible because they are deeply embedded in the elephant's skull. The heaviest pair of tusks, and therefore the heaviest pair of teeth of any extant (still living species) animal belonged to an African Elephant Loxodonta Africana shot in 1897. One of the pair was slightly larger than the other but together they weighed 211kg or 465lb. A single tusk from an unknown African Elephant weighed in at 117kg or 258lb Paris in 1900. This is the single largest tooth of a modern animal. Prehistoric records also go to members of the elephant family. The longest tusk ever found belonged to the extinct Palaeoloxodom antiquus germanicus, the Straight-tusked Elephant. On average this magnificent animal had tusks 5m or 16.5 ft long. The heaviest tusks ever known belonged to the Colombian Mammoth Mammuthus columbi, these weighed 226kg or 498lb. A single tusk from an unknown species that weighs 150kg or 330lb is preserved in a museum in Milan. If the owner of this huge tooth had two approximately the same size their combined weight would have been around 300kg or 660lb and thus far more than the Colombian Mammoth. Apart from elephants, the tusks of walruses can also get quite large - up to 1m long and weighing 5.4kg or 12lb. The canines of hippopotamuses can also be quite impressive. Tusks aside, it is the African Elephant again who comes in as the winner in the largest teeth stakes. A bull African Elephant's molars can be easily be more than a foot long and weigh 4kg or 10 lb. Who Has How Many Teeth? Most placental mammals are happy with between 20 and 40, while most marsupials have 30 to 50. As a general rule, animals that feed on insects have more teeth than either herbivores or the larger carnivores. Several groups of mammals have decided to do without teeth altogether. The 10 species of Whales in the order Mysticeti, the 8 species of Pangolins family Manidae, and the 3 species of Anteaters in the family Myrmecophagidae and order Edentata have all given up on teeth completely and have none. On land the mammal with the most teeth is the Giant Armadillo, which can have as many 100 teeth in its jaws. In the oceans the Spinner Dolphin can have as many as 252 teeth in its long thin jaws. There are more than 100 fish teeth in the ocean for every single animal tooth on land! Most dolphins have 96 teeth and whales have more than 1,000. Barracudas and sharks have several rows of teeth. Sharks eat all day long, they never brush, they never floss, and they never get a cavity. There has never been a single cavity found in the ocean (that we know of). On land we find only two groups of animals that experience tooth decay: human beings (and their domestic pets) and bears. Bears eat gallons of honey at a time, which is why they get cavities. In over 22 countries, humans consume more than 120 pounds of sugar per person per year. Dogs and cats in the wild never get a cavity; but when you feed them human food, they can get cavities. In some countries, like China, most people eat such small quantities of sugar that entire cities are cavity-free. In fact, guess which country has the most cavities per person? The United States of America.